Morocco’s Minister of Foreign Affairs and International Cooperation Nasser Bourita met Wednesday in Washington with US Secretary of State Mike Pompeo on the sidelines of the ongoing meetings with the foreign ministers of the Global Coalition to Defeat ISIS. Rabat – The counterterrorism symposium kicked off today in Washington D.C. with the participation of a Moroccan delegation led by Bourita. During the meeting, the two officials discussed questions of common interest such as the Western Sahara dispute, Iran malign influence in the Middle East and North Africa, the latest development in Venezuela, as well as the upcoming Ministerial to Promote a Future of Peace and Security in the Middle East, which will be held in Morocco. 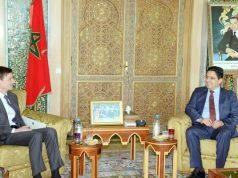 According to a readout of the meeting, which was obtained by Morocco World News, Secretary Pompeo “acknowledged Morocco’s constructive participation in talks with the UN Personal Envoy for Western Sahara and thanked Morocco for its resolute efforts to counter Iran’s malign influence in the region. Bourita and Pompeo’s meeting comes a week after the bilateral meeting held between the US official and the Algerian foreign minister, Abdelkader Messahel, in Washington. This is the second meeting between the two officials in less than six months. 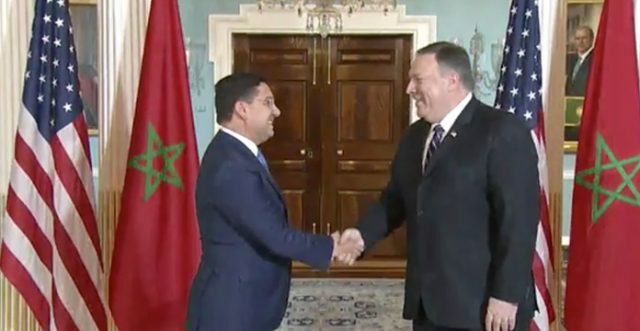 During their first meeting last September, Bourita and Pompeo agreed to hold the US-Morocco strategic dialogue in the US this year. The US is among Morocco’s main partners in several cooperation areas, including counterterrorism. It is also Morocco’s first supplier of military equipment. 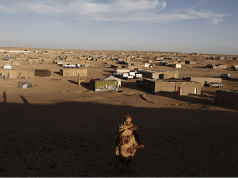 Morocco seeks to secure the Trump administration’s support to its position on the Western Sahara. 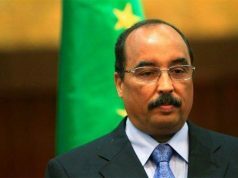 The meeting comes against the backdrop of Morocco’s concerns that the US might abandon it positive neutrality on the conflict after the appointment of John Bolton as National Security Adviser. 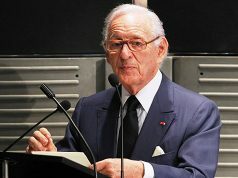 Bolton, who has worked on the Western Sahara for many years when he was assistant of former United Nations Secretary General personal envoy, James Baker, has made no secret of his willingness to end the Western Sahara conflict and to pressure the United Nations peacekeeping to show more realism and effectiveness in their work. In December, Bolton said that he wants to see the conflict resolved, criticizing MINURSO for not finding a mutually acceptable solution despite its presence in the region. “Ladies and gentlemen, 27 years of deployment of this peacekeeping force, 27 years and it’s still there? How can you justify that? I have got to know over the years the Saharawi people, I have enormous respect for them, I have enormous respect for the government and people of Morocco and Algeria, is there not a way to resolve it?” Bolton said as he expressed frustration. Nasser Bourita is due to meet with John Bolton, a source who asked to speak on the condition of anonymity told Morocco World News.